in 12 days 18 hours 46 minutes 19 seconds! SAN PEDRO, Calif. (July 1, 2001) - There was barely a breath of air but a rambunctious start punctuated by a protest Sunday as the last 12 boats set sail in the 41st Transpacific Yacht Race. Rated by potential speed, four are in Division 1, the other eight in Division II. Roy E. Disney's record holder Pyewacket emerged among the early leaders from a high-anxiety scramble at the starting line. The fleet spread out on opposite tacks seeking the fastest route to the west end of Santa Catalina Island, 19.7 miles away and the only mark of the 2,225-nautical mile course to Honolulu. The flat waters and warm day off the Palos Verdes Peninsula brought out a flock of small spectator boats to churn up the sea and create a nautical carnival atmosphere. With the wind only 3 knots, most of the competitors crowded into the starting area in the final minutes before the gun so as not to be left behind. Philippe Kahn's new 75-foot Pegasus got off clear and ahead at the committee boat end of the 300-yard-long line, but at the other end several boats fell into a traffic jam not unlike a city street that suddenly diminishes from three lanes to one. Merlin's Reata, with new owner Al Micallef conspicuous in a white Stetson, tried to poke its star-studded bow between Bob Lane's Medicine Man and the inflatable orange buoy. No way. Members of Medicine Man's crew held Merlin's Reata off with their hands as the latter went dead in the water. The rebuilt Merlin's Reata, until recently known simply as Merlin since 1977 when it set a Transpac record that stood for 20 years, executed a penalty turn for touching the mark, crossed the line again five minutes later and unfurled a red protest flag. The claim apparently will be that Medicine Man failed to give room. That issue will be resolved after the boats finish in the next week to 10 days. Pyewacket, which set the record of 7 1/2 days in 1999, started behind other boats in the middle of the line but tacked once to get well left of the fleet, then tacked back in what appeared to be a strong position. Grand Illusion, James McDowell's overall winner in '99 on corrected time, and Bob McNulty's new 74-foot Chance also were looking good as the fleet disappeared into the haze of the San Pedro Channel at a general speed of 5 to 6 knots. Brian W. Mock's chartered ULDB 70 Taxi Dancer, a former overall winner from Corona del Mar, Calif., was 4 1/2 minutes late to the starting line. It was a matter of great speculation what smart navigators like Stan Honey on Pyewacket and Mark Rudiger on Pegasus would do after they passed Catalina. Normally, they would head south to avoid the Pacific High and pick up the trade winds. But Sunday's latest forecast indicated that the best winds - at least for now - were along the rhumb (direct) line to Hawaii, an uncommon occurrence for the race. Among the smaller Division III and IV boats that started Saturday, Grant Vaughan's Andrews 53 Cantata from San Francisco and Seth Radow's new Sydney 40 OD-T (Bull), Marina del Rey, Calif., held early leads, respectively, averaging 7.9 and 7.0 knots in moderate breeze. Waikiki YC's Dan Doyle, sailing the 30-foot Two Guys On the Edge doublehanded with Bruce Burgess after a 47-minute delayed start, was in the chase virtually alongside Bill Allan's fully crewed Canadian entry, LawnDart. Doyle reported by radio: "We are moving along doing 6.75 to 7 knots. The weather is gorgeous. 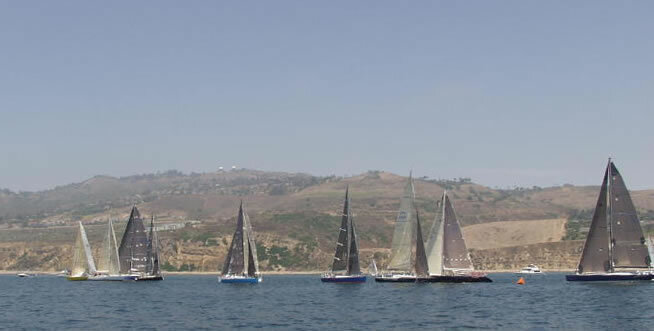 We rounded [the] west end of Catalina around 5 p.m. [Saturday] and have been playing pass and be passed with LawnDart. Currently they are 500 feet in front of us. The borrowed headfoil was very brittle and one of the foils broke while installing it. We have one foil and will be doing baldheaded changes for the race. We are delighted that this race-ending disaster has turned into a minor setback. We are in good spirits and looking forward to hitting the trade winds. Aloha to all." Out front, the eight Aloha boats also continued to search for robust weather, but Wendy Siegal's Willow Wind, Sunset Beach, Calif., seemed about to steal the show from larger rivals. The 36-year-old Cal 40 took a bold dive south for stronger winds early on and now has worked its way from sixth and last to first on corrected time in the Aloha-A Division.